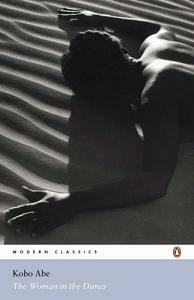 "A bonkers-looking Japanese book about a man who gets taken hostage in a desert." As a fan of all things Japanese and bonkers (in my estimation, 'bonkers' is high praise indeed), I was really looking forward to this, but it didn't quite live up to expectations. An amateur entymologist, who remains unnamed for nearly the entire length of the book, travels to a tiny beach-side village to look for insects in the sand dunes. He notices that the village is arranged curiously: each house sits at the bottom of a deep hollow in the sand, almost as if the dunes are crashing over the village like waves. Having missed the last bus, he accepts the villagers' hospitality, climbing down a rope ladder to share a woman's house at the bottom of a sand-pit ... but when he wakes up, the ladder is gone. The sand is too steep to climb or dig out, and he finds himself a prisoner. The villagers force him to work, shovelling sand all night lest the house be buried, and the bulk of the plot is concerned with his attempts to escape and his curious relationship with the woman who's stuck down there with him. This book swings wildly between being pretty great and pretty dull. Once the man is in the hole, it works best when it concentrates on being a micro-drama of man versus nature, as the man tries to figure out a way to escape with the extremely limited tools available to him. As Abe methodically takes his character through different stages of anger and depression and hysteria, and lets him try scheme after scheme to make his escape, the book is strangely exciting. Unfortunately, it's marred by a couple of things. One is Abe's insistence on philosophising about the meaning of the man's predicament, and about the meaning of sand itself. I've never been a big fan of jamming non-fiction essay-type writing into the middle of a story (eg. the annoying section in 1984 where Winston Smith sits down and reads a book about how his world works), and either Abe or his translator does it without a whole lot of elegance. Supposedly it's a classic of existentialist literature, but for a brilliant example of a novel that contains philosophical themes without being weighed down by them, check out The Plague by Albert Camus, one of my very favourite books --- yes, I am a wanker, but at least I didn't say The Outsider. There's also a large-ish section in the middle of the book where the character has a mental and physical breakdown and, for a time, the book stops making any sense at all. Take those sections out and it's probably not long enough to call itself a novel, but it would have been a much better story. Oh well.